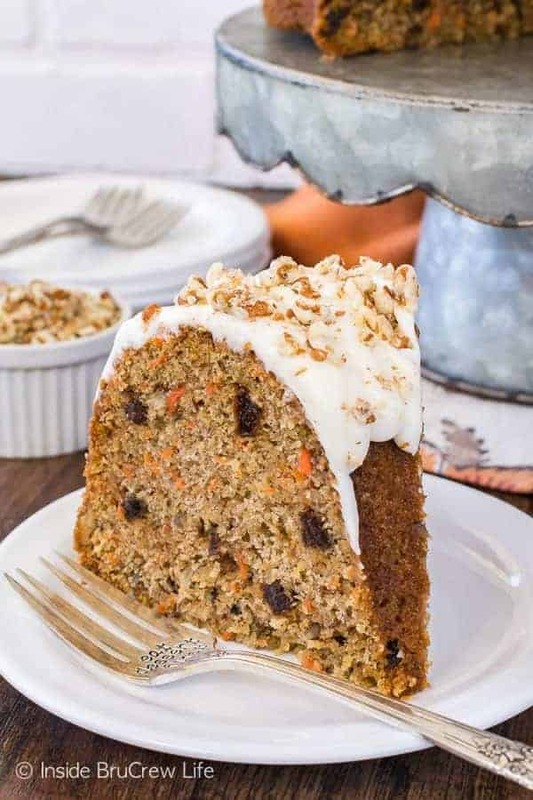 So, carrot cake is one of those cakes that I do not make around here very often. Not because I don’t like it, but because I’m really the only one in the family who actually does like it. I take that back. I think my husband does like this cake, but he has this crazy good self control and doesn’t crave sweets like me. If I make a carrot cake, then I will be the one consuming the entire cake. And that does not make my skinny jeans very happy. Most of the time, I just reserve carrot cake eating for when we go out to eat. 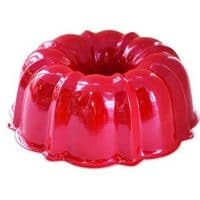 Then I can enjoy my favorite cake in a one slice form. 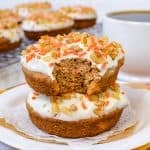 Or I make carrot cake donuts and pretend like the carrots and pineapple make them a “healthy” breakfast. You should know by now that when I get a crazy baking idea, I can’t rest until I get in the kitchen and try it out. Turns out a double batch of the bread batter totally makes an amazing looking cake. 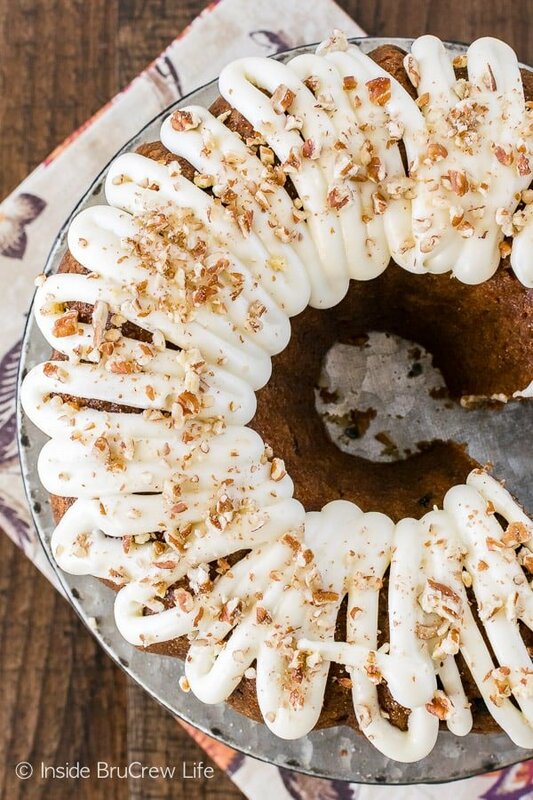 I’m sure you also know that I have a hard time making the same thing twice, so of course I had to give the carrot bundt cake a fun little twist. 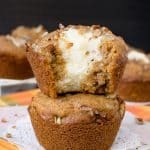 Instead of using coconut, I added pecans and raisins. I realize that there are people out there cringing because I just said raisins. Hopefully there are the same amount of people out there cheering because of the raisins. I happen to be a raisin lover myself. Give me a sweet oatmeal raisin cookie, and I’m a happy camper. If you are against raisins, feel free to leave them out. 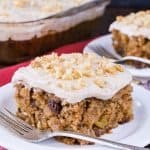 Raisins and nuts add such a great flavor and texture to this dense cake. One quick tip: I have found that freshly shredded carrots do add a better moisture content to this cake. 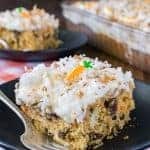 I tried it with already shredded carrots from the store, and the cake turned out a little drier. And of course, what kind of cake would it be if there wasn’t frosting on top! You can either drizzle the frosting on top in thick lines like I did, or you could just use a spatula to spread it over the entire cake. I go back and forth on what version I prefer. Having the frosting covering the entire cake keeps it from drying out faster, but the lines look so much prettier. There really is no right or wrong way to do the frosting. Unless you are crazy and leave it off completely. Then I’m not sure if we can be friends. Ok, so I’m totally kidding. I would never diss you for leaving off the frosting. Ok, so I would probably give you a funny look, but then I would take your frosting, so then we would be cool. 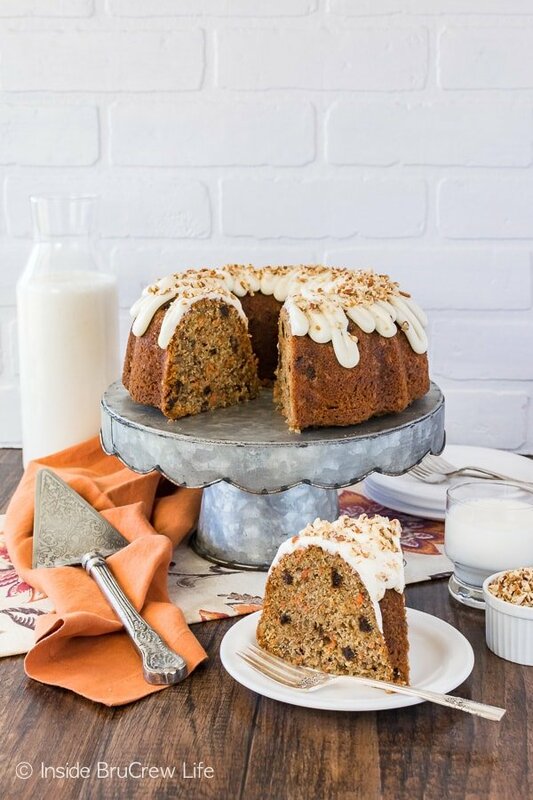 If you are a carrot cake lover like me, you need to check out these fun recipes. 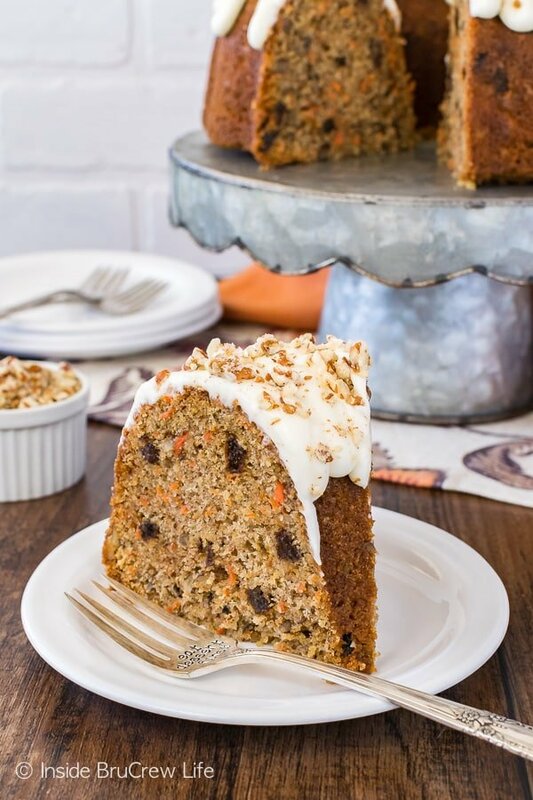 This Carrot Cake Roll from Dorothy is a fun and unique way to have carrot cake. And I love that Sandra added chocolate to here German Chocolate Carrot Cake. Of course, Joanne is a girl after my own heart because she made Carrot Cake Pancakes. Gotta love when you can have “cake” for breakfast!! Preheat the oven to 350 degrees. Spray a 12-cup bundt pan with nonstick baking spray. 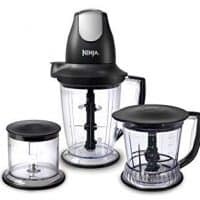 Mix together the oil and sugars until it looks like wet sand. Add the eggs, vanilla, and sour cream and beat until creamy. Stir together the flour, baking powder, baking soda, salt, cinnamon, nutmeg, and cloves. Add 1/2 the flour mixture to the egg mixture and beat until mixed in. Add the rest of the flour and beat again. Stir in the carrots, pecans, and raisins by hand. Pour into the prepared pan. Bake for 55-57 minutes, or until a knife inserted in the center comes out with a few crumbs sticking to it. Remove and let the cake cool in the pan for 15 minutes. Place a plate over the top of the cake and flip the cake out. Let cool completely. Beat together the cream cheese, butter, vanilla, and salt until creamy. Add the powdered sugar and milk and beat until light and creamy. Spread or pipe the frosting on the cooled cake. Garnish with chopped pecans. Store tightly covered in the refrigerator. Cut cake into 14 slices. Serve chilled or warm each slice for about 10 seconds in the microwave. Gal after my own heart. 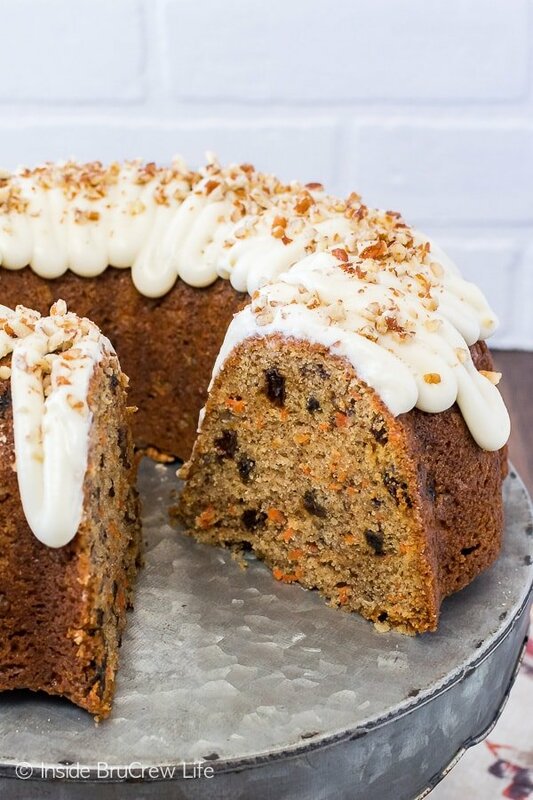 I thought I was only one who put raisins in their carrot cake. If I had no raisins on hand then I would use a small; Very Well Drained can of crushed pineapple. Me, I’m a frosting spreader and usually cover mine with toasted coconut. DELICIOUS looking. 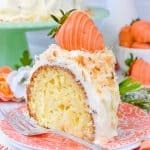 I love carrot cake, bundt have never tried it like this! (hahaha) – beautiful work!